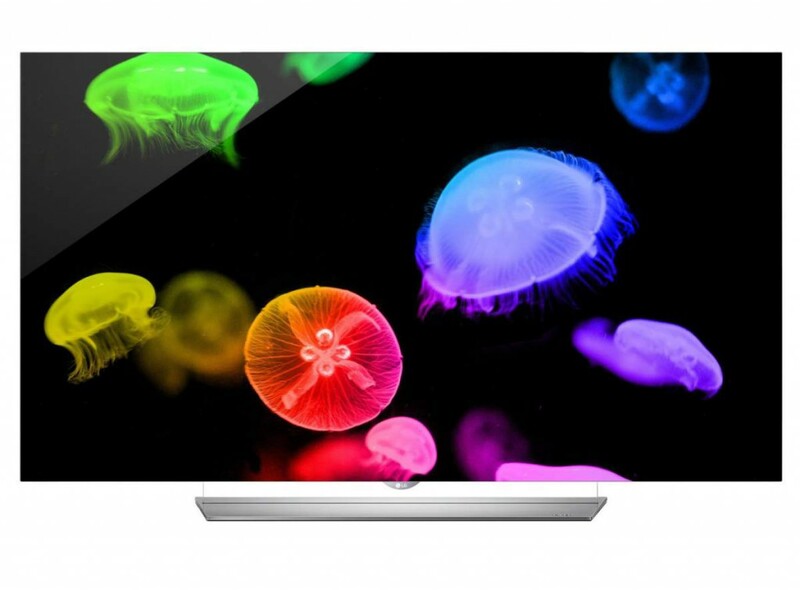 So what makes OLED that much better than other current and past television technologies? The answer is simple… infinite contrast and perfect black capabilities. This is accomplished by organic light emitting diodes (OLEDs) that make up the pixel structure of the display panel. These pixels are self-illuminating and can be switched completely off which allows the TV to achieve perfect black levels for infinite contrast. OLED TVs also deliver incredibly intense color reproduction that is vivid and accurate with plenty of dynamic punch. 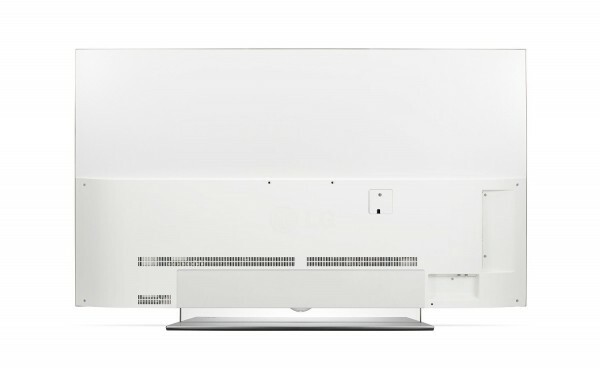 LG’s EF9500 certainly delivers on all of the above characteristics and a whole lot more. The EF9500 is a beautifully crafted television. It showcases an ultra-slim design that is approximately 1/4″ thick at its narrowest point, and just under 1-1/2″ at its thickest point which contains the electronics of the display panel. The black bezel that surrounds the screen is super thin and measures just over a 1/4″. The glossy screen contains an anti-glare coating which I’m happy to report, does not make the picture appear dull or flat. For me personally, the main design attraction of the EF9500 Series is its flat panel design (yeah!). 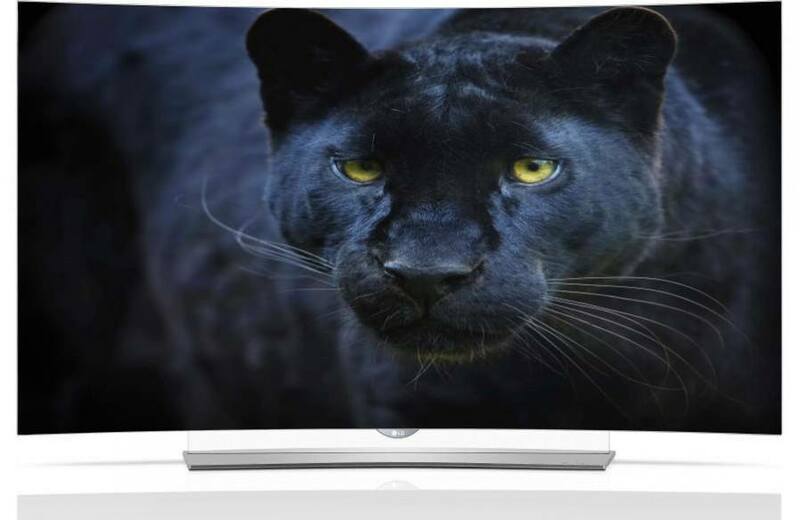 Gone is the curved design of LG’s other current OLED series models. Don’t get me wrong, I have nothing against curved TVs. It’s just that I prefer a flat panel design, and in my opinion, a cured design does nothing to enhance picture quality and is all about aesthetics. I also appreciated this TVs stand design… it adds a subtle yet attractive element to the TV’s overall appearance. The TV and stand are connected by a piece of clear acrylic, giving the TV an illusion of floating in mid-air. I found the rear panel of this display to be somewhat appealing due to its a-typical white casing other than the usual black or gray colored designs found on most flat panel TVs. The onboard two-channel sound system was designed by harman/kardon for enhanced audio performance. More on sound later. LG’s webOS 2.0 smart TV platform is one best available in the industry. This latest version is faster (quad-core processor) and even more user-friendly than its predecessor, letting users effortlessly switch between content, programs and a number of apps including Netflix, Amazon Instant and many more. Booting time has been reduced by up to 60 percent, and connectivity to external devices is even more effortless than before. 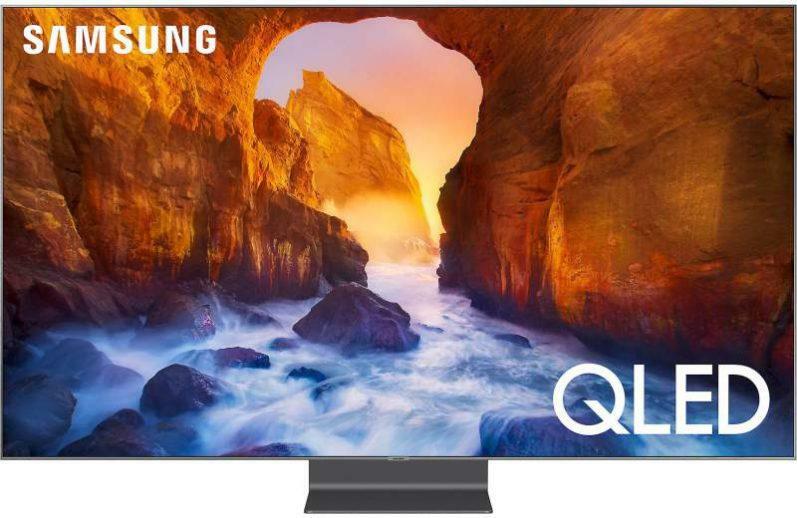 If you have not yet checked out a 4K OLED TV, then you owe it to yourself to see the stunning and breath taking picture quality these displays have to offer. The 65″ EF9500 delivered about the best picture quality I have seen to date. And honestly, you just can’t truly realize how good the image quality of the EF9500 is until you compare it with an LED display. 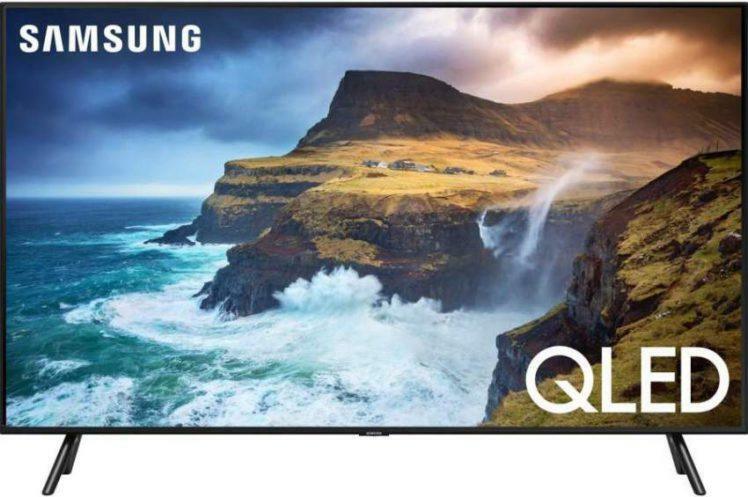 The promient areas of picture quality that distinguish the EF9500 when compared directly to a high quality LED TV are the much better contrast and black levels. The dark areas of the picture image on this set were absolute black, which allows for an infinite amount of contrast. This combination of excellent contrast and black level reproduction truly impacts image quality giving it an extreme amount of dynamic punch. One other aspect of the EF9500’s outstanding picture quality is its incredible color rendering. The wide color gamut produced by this display was so amazingly vibrant and accurate, which in turn gave the onscreen color palette a natural and life-like presentation. With that said, there are not many televisions currently available that can truly match the color rendering of the EF9500 as well as LG’s other OLED displays, in my opinion. 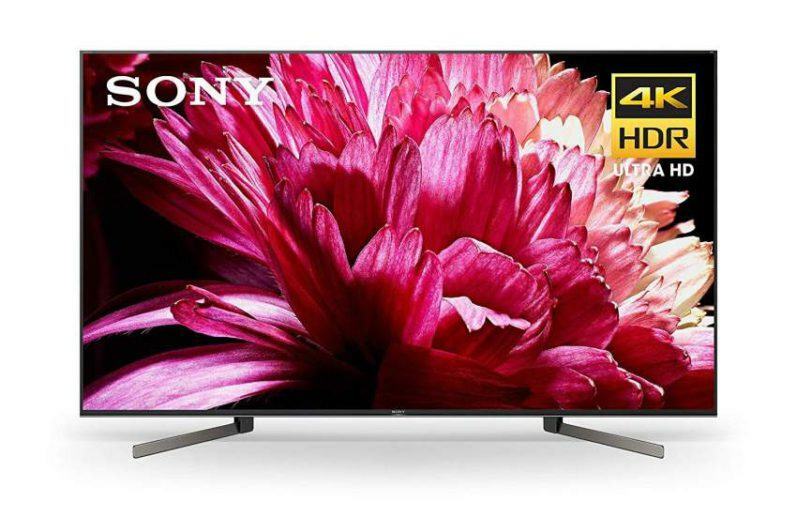 If you’re looking for a display that can be viewed at very wide angles without the loss of contrast and color saturation, then the EF9500 will suite your needs… I viewed this TV at extreme wide angles and didn’t experience any contrast or color loss. Excellent performance. Motion blur wasn’t an issue with this set, and was on par with the best performing LED TVs in their respective categories. The haman/kardon audio system did provide better than average sound for a flat panel TV design. The sound quality delivered plenty of detail and clarity, and a more full bodied audio presentation than what I typically hear from most flat panel TVs. However, the bass output of this system didn’t provide enough impact or punch for my taste. 4K upscaling is also good on this set, especially with 1080p sources such as blu-ray disc. My biggest gripe with the EF9500 is its price tag. Although, LG recently had substantial price drops on its current line of OLED TVs, the price is still a bit on the expensive side when compared to LED models of similar size and quality. In past LG OLED models, there were some problems with screen uniformity – some areas of the screen were brighter than other sections. However, during my evaluation of the EF9500, I didn’t detect any screen uniformity issues with the content I viewed. Judder can be an issue on 24fps content (movies). You can use the TV’s TruMotion settings to minimize this issue. Input lag is a bit on the high end, in my opinion, at just over 53 ms., but still decent enough for video gaming. LG’s EF9500 continues with the tradition of the “best picture quality ever seen” and sets the bar for picture image excellence . I must say I was thoroughly impressed with the performance of this television. Its picture quality is second to none when compared to LED models, thanks in part to its phenomenal black levels and contrast capabilities. Now all we need to see is continued price drops and more consumer awareness of this great technology so that it reaches the masses and hopefully becomes, or dare I say, will become, as common place as LED displays in the market place.